Mt. Shasta is the second highest but perhaps the most magnificent of the volcanic peaks that form the Cascade Range, a line of isolated mountains that stretch from Lassen Peak northwards all the way to the Canadian border. Permanently snow-capped and appearing perfectly conical from a distance, Mt. 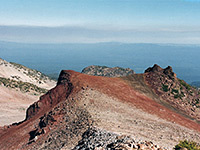 Shasta is well separated from any other competing peaks and rises 10,000 feet above the surrounding forests with its distinctive outline visible for up to 100 miles in all directions. It is a beacon for north California, drawing many visitors to its extensive slopes and to the nearby lands that also have much of interest including the Castle Crags Wilderness, the McCloud River and the varied scenery of the Shasta and Klamath National Forests. 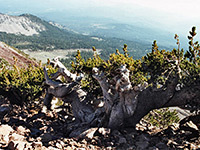 The highest parts of the mountain are protected as the Mount Shasta Wilderness which includes seven separate glaciers and a variety of volcanic features. 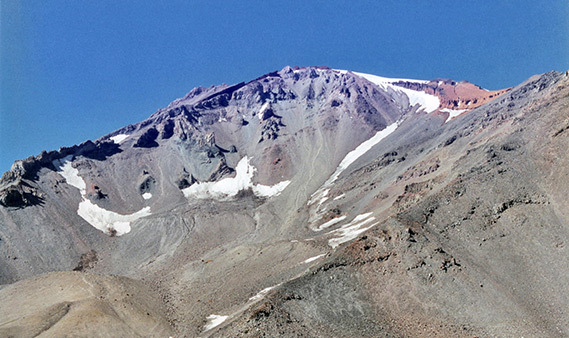 Mount Shasta is a volcano, active in a geological sense, but not in recent times - the last eruption was around 1800 though various hot springs and sulphur vents in the locality hint of continuing subterranean energy. 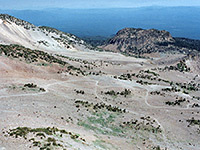 It sits amongst several much smaller cinder cones in the densely wooded Shasta National Forest in the far north of California, a few miles east of US 5 and the towns of Weed and Mt. Shasta. US 5 curves around part of the mountain, then CA 89 and the unpaved Military Pass Road circle around the other 3 sides; a full tour takes about 2 hours and may only be possible for several months each year because of the heavy snowfall in this region. A few jeep tracks climb some way higher up the slopes but the only paved approach is the Everett Memorial Highway, which winds through the pine woodland on the west side and ends above the treeline at 9,200 feet. It starts at the north edge of Mt. Shasta town and is quite straight at first, passing one campsite then becomes steeper and more bendy, with frequent overlooks, and finishes at a large parking area. The short growing season at this elevation results in very little vegetation, and the melting snows of early summer reveal just scattered wildflowers, grassy patches and a few bushes. There are no official trails up the hill - paths develop during summer but are obliterated after winter snowfall. The carpark is one of several trailheads for hikes to the summit, 6,000 feet higher, although only around one third of the 15,000 each year who attempt the trip on one of the 17 recognised routes from all starting points are successful. A round trip takes 10-20 hours so a night on the mountain is normally required, as is $20 for a permit, needed for all explorations above 10,000 feet. 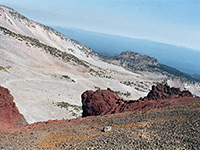 For those not making the full climb, even a short walk is rewarding - one good option is Green Butte, a protruding outcrop at 9,200 feet - the route is along the wide valley beyond the end of the road then up a slope of lava boulders to a steep ridge also composed of lava, with a bank of colorful red ash nearby. Besides the interesting formations this has great views over lesser mountains to the west, and also of note are a few very ancient-looking windswept pine trees. Camping on the adjacent national forest land is unusually restricted, permissible only in paid sites - warning signs to this effect are posted at every track leading into the woods. It is free though beside Lake Shastina, just a 15 minute drive up US 97, which has expensive-looking estates to the north and east but a good free site on the southeast edge, with tables and water provided. In summer at least there is likely not to be a lake though - in hot weather this dries up completely and is used for cattle grazing. Near the middle of the town of Mount Shasta, Best Western The Tree House Motor Inn occupies quite a large site surrounded by pine trees with many of the 98 rooms (on 3 floors) enjoying views across the forest to the mountain, 10 miles east. The hotel is just east of exit 738 of I-5 - E Lake St, a road which meets the Everett Memorial Highway in the town center. Facilities of the Best Western include an on-site restaurant & lounge, heated indoor pool, spa and various meetings/banquet amenities. Free hot breakfast is served. Other nearby towns with hotels: Weed (9 miles), Yreka (37 miles) and Redding (60 miles).